Use Multi-Cam Master's unique version tracking number to ensure that everyone has the correct version! Print Cue cards uniquely customised to each presenter/ actor. Create running orders with specific information for each crew member. Export running orders (customised as you like them) to Microsft Word or Excel so that anyone can view them. Synchronise the work of several people with Multi-Cam Master's unique synchronisation system. Use LIVE MODE to have Multi-Cam Master perform all your time calculations, and present you with a live streaming graphic version of your show - simply read your show off the monitor! Download Multi-Cam Master from the Download page. Use Multi-Cam Master for free for a 30 day trial period. "MCM has revolutionised my working life ... I can't imagine how I ever worked without it!" "I insist on having the live graphic (live mode) fed to a monitor in the production area. It's comforting to see at a glance where we are, whether we're heavy or light. Everyone's on the same page"
Survivor SA & Survivor Africa final shows live broadcasts. AFDA film school now uses MCM for all their multi-cam projects. Multi-Cam Master is THE software application for the successful pre-production of multi-camera shows. Finally the problems which plague so many multi-cam productions are a thing of the past. 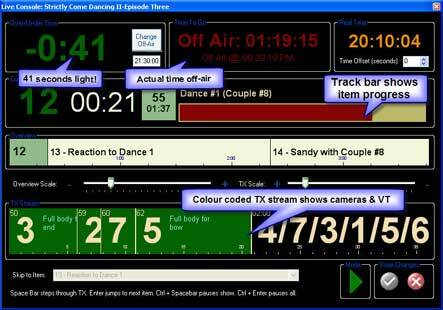 Using Multi-Cam Master it is possible to co-ordinate script, camera blocking, timings and more. Multi-Camera Television production is a field of production that is notorious for being difficult to co-ordinate. The deadlines are usually tight - a live broadcast waits for nobody! And so making sure you are completely prepared is often a rush ... To further complicate the pre-production phase there are usually several people who need to provide input into the show, and co-ordinating what they are doing can be a nightmare. How often have you arrived at a multi-cam shoot to find that every crew member has a different version of the script? Item numbers have been changed by an enthusiastic scriptwriter and so camera crew with scribbled camera cards (if they have any at all) are looking at the wrong item number. The director is confused about where VT's are meant to fit in, and the success of the show seems to rely on the ability of everyone to "busk". Multi-Cam Master provides the ability for several people to work simultaneously on a show. A producer is able to adjust the structure of a show at the same time as a scriptwriter works on the words. A director can plot camera shots, and not have to start from scratch if the producer decides to change the sequence of events. Multi-Cam Master guides the user through the process of synchronising several people's work with a Master file - so that everybody is kept up-to-date, and knows that they are working on the correct version of the show - the latest one! Printing professional, clear camera cards is as easy as clicking a button. Presenter's cue cards are similarly not a problem - cue cards which are individualised to each presenter. Never again face the terror of a multi-camera television show without being thoroughly prepared. Multi-Cam Master provides the professional solution to creating a professional production! Multi-Cam Master exports running orders to Microsoft Word or Excel, and so exchanging running orders with everyone prior to the shoot is easy, and completely accessible. The running orders are also completely customisable - no need to bother an executive producer with all the details they would rather not know, simply export a running order with only the information they need. Multi-Cam Master's Live Mode is perhaps its greatest feature. Take MCM into the OB Van or control room with you, and have it play the running order out to you in a constantly streaming, genuinely live presentation of your show. The digital age is truly upon us, and MCM's Live Mode finally takes Multi-Camera crews into the digital realm. No more peering at printed running orders in the gloom of a control room. MCM's Live Mode presents your running order to you in simple, easy-to-read streaming graphics. Plug your laptop in as a video source, and ALL crew can watch the running order unfold on monitors wherever they are. Live Mode shows you constantly whether you are over or under time, and tells you exactly what time you will be off-air. The TX Stream presents the cameras and VT's coming up, with a simple graphic representation of when they should be taken to air. Live Mode's Recording facility allows you to enter cameras as you see them during a rehearsal, 'on-the-fly' - which are then automatically fitted into your running order, and can be easily printed to camera cards. All the hard slog of imagining and then writing down each camera shot is done for you! The exact time at which a shot is taken is also recorded, as well as the shot's duration. All you need to provide is a description of the shot. We promise that Multi-Cam Master's Live Mode is going to revolutionise the way that you plot your shows. Once you've tried it, there's simply no going back! If Multi-Cam Master's features sound too complex for your needs, don't be deterred. Multi-Cam Master has the potential to do so many things, but it is entirely scalable to your unique needs. If your show involves only 2 or 3 cameras which each hold the same shot for the duration of the show, and a single presenter speaking into one of those cameras, you will still find tremendous benefit in being able to communicate your simple needs to your crew (and presenter) quickly and clearly. Multi-Cam Master is available for free for a trial period of 30 days! After that time most of your team can continue to use the software completely FREE, on a Limited License, which has two limitations: one cannot print (or export) from the software, and one cannot use Live Mode. An upgrade to a Comprehensive License is simple, and available for a monthly fee. This system means that a production can have many people work with the software (which is one of its greatest features), for free! Only one person needs a "printing" license. This makes Multi-Cam Master extremely cost-effective. For further details, please contact Fortuna. In the meantime, why not download the free trial version of the software?